I haven’t really worked on many personal projects lately; indite is the only one worth pointing out. [i]ndite is a little something to help you create stuff. It could be some creative writing, or a humble grocery list (or a hitlist). If you do your thinking better on plain paper than on a text editor, you might like this. 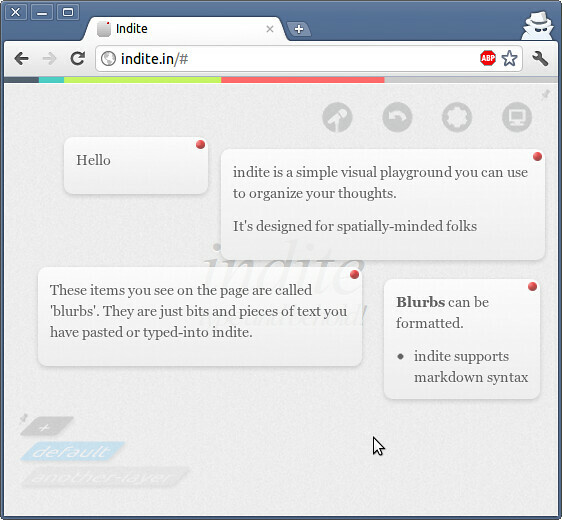 indite is a simple visual playground that you can use to organize your thoughts. It’s open-ended & designed for spatially-minded folks. Here is what it looks like: Do visit the Flickr page in order to see the notes on various parts of the interface. Basically, think of it as sticky-notes combined with an iGoogle-like page, and inspired by Apple’s aesthetics. We don’t really know where exactly we’ll end up taking this. It’s pretty open-ended right now. I use it for taking meeting notes, outlining documents and collecting research notes. Amit seems to like using it as a todo-list. We want to keep it this way: simple, but powerful. The word ‘indite’ basically means “to produce a literary work” (thanks Wordnet!). I really love the name, the application is definitely text-centric. It’s great that we got the domain for it! We call the individual bits of text placed on the screen ‘blurbs’. Well, they are not actually blurbs, but this was the most suitable name that we came up with. Also, I like how blurb sounds, so the name stays. Start typing on the page. Press Ctrl-Enter when you’re done. You can drag it around, if you feel like it. Type to add more blurbs. Delete them when you no longer need ’em. Uh, this is pretty much it. Feature-wise, the one thing I really like about it is the ability to have multiple layers of blurbs. I like having a layer per-topic, usually. Storage is done on the browser. God bless HTML5. I really want to create a back-end for this using node.js, which seems like a perfect fit. I’ve been particularly lethargic recently though, so who knows when this will happen. We have plans though… big plans. Expect something or the other to happen, though. The ability to export data (by layer, or the entire stack) would be really useful. This was posted by Ankit Solanki on Sunday, May 15th, 2011 at 17:17. Bookmark the permalink.